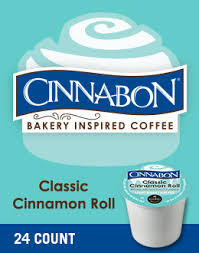 Escape from the everyday with Cinnabon® bakery-inspired coffee. We’ve combined the indulgent tastes and irresistible aroma of a freshly baked treat with the finest 100% Arabica coffee beans. Go ahead and enjoy the extraordinary flavors of Cinnabon® in the comfort of your own home, because you deserve it. life needs frosting®. 24 Kcups per Box. 4 Boxes per Case.